The goal of the UAV Challenge is to demonstrate the utility of Unmanned Airborne Vehicles (UAVs) for civilian applications, particularly in those applications that will save the lives of people in the future. We do this by harnessing the ingenuity and passion of aero modellers, university students around the world to develop novel and cost-effective solutions. 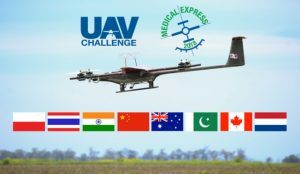 The UAV Challenge Medical Express – an unmanned aircraft competition that demonstrates the use of robotic aircraft for medical sample retrieval and medical delivery, and open to adult teams from around the world. 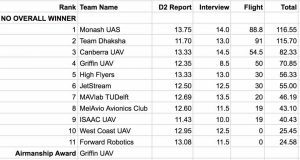 This competition is focusing on autonomy of unmanned aircraft. Outback Joe is at his property in remote Queensland, Australia and has been feeling unwell. He has had a remote consultation with his doctor using video conferencing, and his doctor has requested some blood tests be done as soon as possible. Joe is well prepared, has a home sample taking kit, and has taken his blood sample. The challenge is now to get the blood sample to the lab. Joe’s property is very remote and to make matters worse, it has been cut off by floodwaters. Teams are invited to attempt to retrieve a blood sample from the remote Outback Joe and return it to base where medical staff will be waiting to analyse it. Teams are encouraged to develop systems that can carry out the mission in a fully autonomous manner using Type 2 Autonomy. The Mission has to be completed within 60minutes of time, covering maximum flying range of 60km. 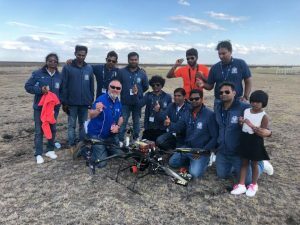 The UAV Challenge Medical Express 2018 event will be held at the Dalby Model Aero Club, 743 Cecil Plains Road, Dalby, Queensland, Australia during 24th – 28th of September 2018.